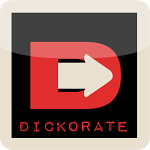 I would like to personally thank the developers of Dickorate for making an app that is slightly less-obviously ripe for the banning on the Play Store. However, avoiding cartoon imagery of naughty bits still might not be enough to save this app from the banhammer. The Dickorate app allows you to take pictures of any elongated cylindrical object you have handy and add mustaches, hats, sunglasses, and more. To save you the trouble, I have personally tested this app and included the image I took below.